The “Tsuki-no-Niwa Gallery” is one of the cultural foundations at the Keihanna Commemorative Park. Located in the Suikei-en (Japanese Garden) on the 1st floor of the Kangetsuro Hall. The place has a view of the garden and satoyama (nostalgic Japanese countryside), allowing visitors to enjoy art appreciation with a wonderful scenic view of the park. Visitors can also enjoy outdoor exhibits in the garden and satoyama area, which is a park gallery’s unique charm. Art exhibits, mainly from spring to fall, can be enjoyed for about 150 days in a year. Special Exhibits: Culture and environment theme art exhibits that are perfect for this park. 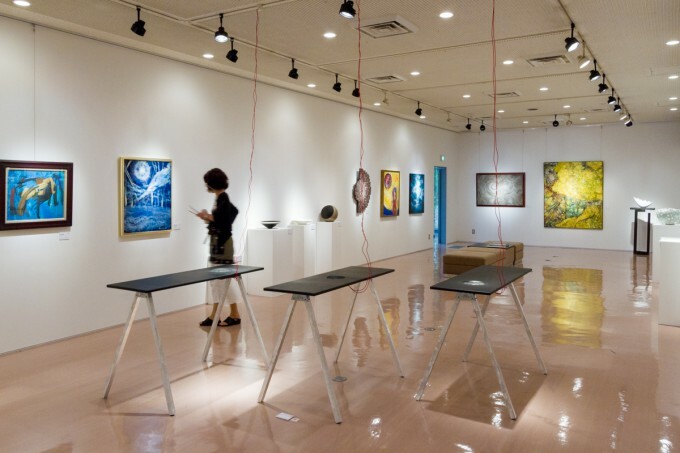 Local Submission Exhibits: Art and photo submitted by the public are exhibited under the following 3 categories: Moon art, park photos, and photos of the local Keihanna area. Collaborative Exhibits: Local groups and art university collaborated art exhibits. Rental Gallery Space: Exhibits produced by various artists and local art fans.